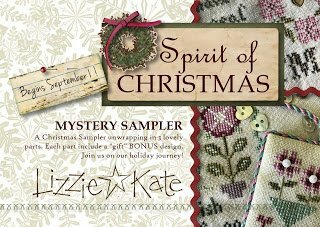 The Spirit of Christmas Mystery Sampler is a 3-part series that will ship in early September, October and November (finished in time for Christmas, of course). * Stitch Count for Spirit of Christmas is 95W x 191H. Not too big, not too small, just right. * Spirit of Christmas is stitched on lovely Heartland linen from Picture This Plus. We worked with Marilyn and the Picture This Plus gang to create a gorgeous neutral color. There are 4 fabric options...28 and 32 ct. Heartland linen, as well as 14 and 16 ct. Heartland Aida. All fabrics are precut with 3" border on all sides, serged, and individually packaged. You can also personalize with your own fabric choice. * Spirit of Christmas thread pack has 11 skeins of Weeks Dye Works overdyed threads, including an exclusive new color we requested especially for Spirit of Christmas! * Embellishment Pack with goodies designed especially for Spirit of Christmas. This pack includes embellishments for the main sampler, as well as the 3 BONUS projects. Please visit our website for pricing, fabric choices, etc. Email me if you would like items reserved for you. PRE-ORDERS are being taken now by all shop - we don't want you to miss out. AND we have discounted all the charts, fabrics, embellishments, and threadpacks as our gift to you.